‘Nice weather yes?’ Omar said as he came alongside me at the window of the Ministry. 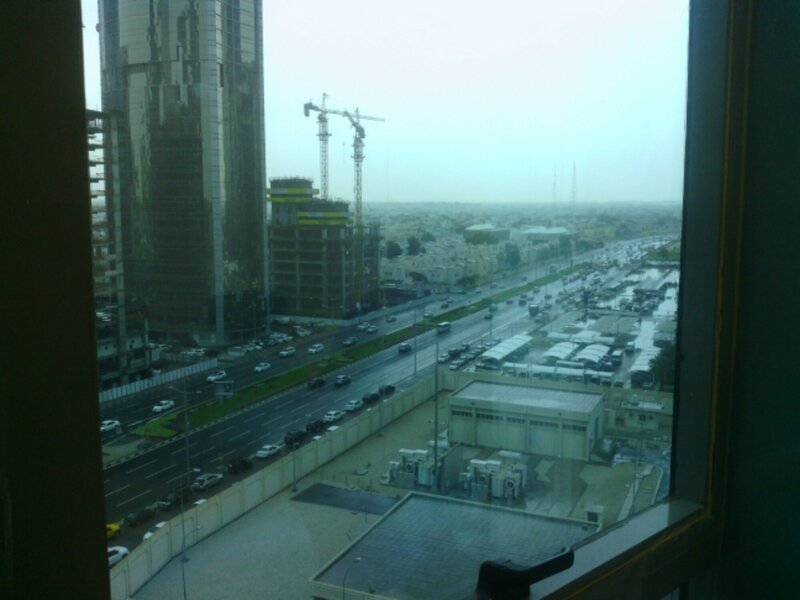 I stared out across the city from the 7th floor, towers, embassies and houses all mired in damp, overhung with clouds while the cars weaved between gathering puddles. ‘I’ll go to the desert this afternoon’ he added. 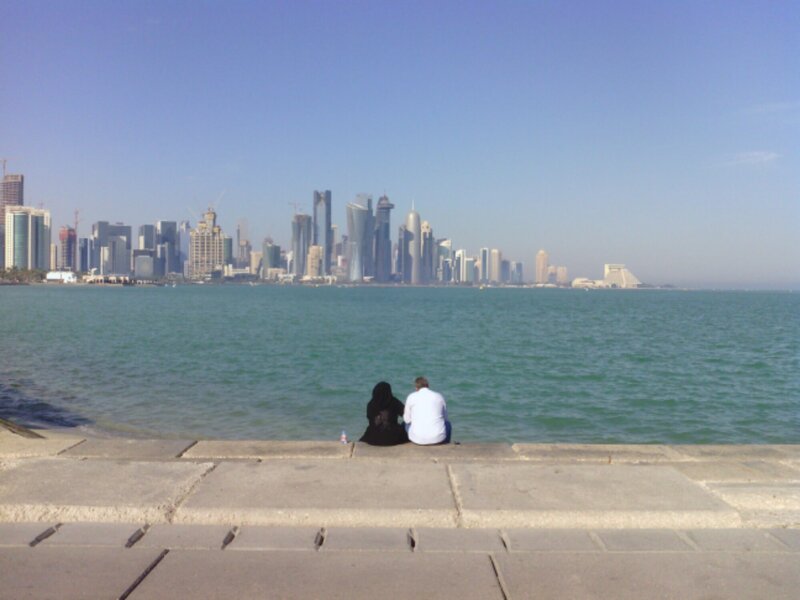 Qataris love a cloud. They enthuse about the weather in London. They take pictures of rain, smiling with wonder. It is their snow. The streets become flooded emphasising the lack of drainage and that the roads are not built level. Water gathers in the huge diverts. A day later and it’s all evaporated away and the weather begins to heat up again firstly to a beautiful day followed by the inevitable plateaus. ‘That’s winter over then!” A Qatari said this to me on about January the 7th. The weather here has 2 seasons; cooler and hotter. The only real change is the temperature. The sky looks the same throughout. In winter it will drop to the high teens with the occasional drop below 10C on a particuarly cold day. But that’s only for a day or two, then it returns to normal, a slow shift up or down until the summer heights. The highest I’ve seen was 53C one lunch time. That was in the shade. The heat itself I find bareable. It’s the wind that comes with it whistling down your throat, drying you out. At night the humidity comes but at least the temperature is only in the high-30s. 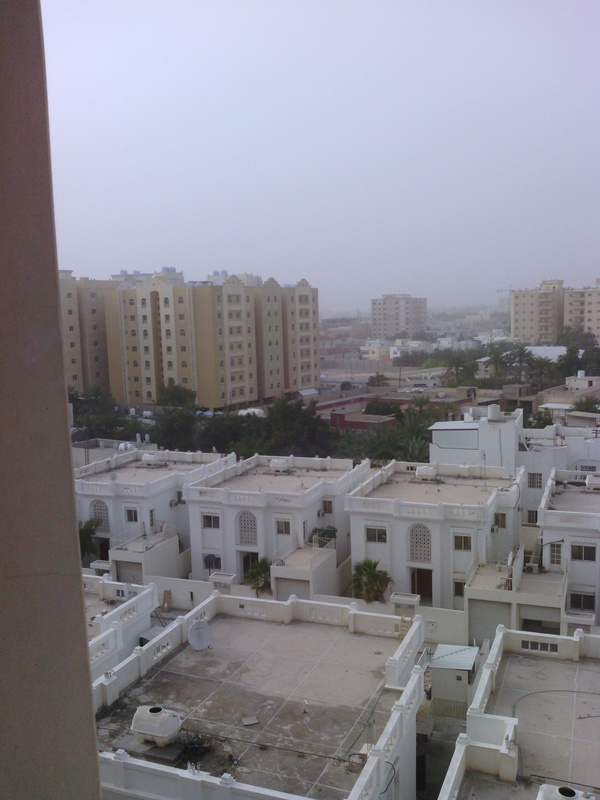 We get the occasional sandstorm, reddened clouds whipped in from Saudi. They carpet everything in dust, yet more dust. Dust on dust. Dubai, the tourist image of the Middle East sells itself as a paradise of beaches and shopping. If you like endless malls full of wandering people then great. If you don’t mind traffic and moronic drivers even better. And if you can handle state-sanctioned feudal hierarchy whereby people are brought in to serve masters then it might be the place for you. Coming here in summer tell you the fuller story of the relentless weather in the region from May to September. Daily temperature of 40C become normal. Life involves fleeing from one air-con area to another and weekend activity becomes limited. Gulf Arabs flee to Europe, mostly London to sit in the parks and shisha cafes of Edgeware Road. The roads in the Gulf are noticeably quieter, life is more sedate for those who stay. Ramadan is usually in summer. Imagine fasting for a month during those temperatures and being unable to drink water between sunrise and sundown. Fasting itself is said to be healthy. Fasting in the Gulf is tough. Fasting in Norway where the sun is always up is ridiculous! With those kind of stresses, it’s understandable the perception of the weather is wholly different in the Gulf. Having to live in air-con is no cold comfort. But for now it’s a perfect day here. I’ll be seeing you….outside. Seoul never held the same affection for me. Most foreigners who’ve worked or been in Japan before Korea find it rough and lacking the fascination. Others especially Canadians find Korea cheaper, more down-to-earth and easier to live in. The truth is they probably all hang out in Itaewon living an expat life with little contact outside of work with Koreans. Seoul itself was badly damaged during the war and the post-war architecture hasn’t helped. The mentality of Koreans is very different to the Japanese. Korea is noiser, more abrasive, more ‘Chinese’ than Japan. Its culture lacks the sophistication and textured beauty of Japan. Its food are meatier, its streets meaner and the language simpler but rougher. Yet its ridden an economic and cultural wave over the last 10 years. Formerly Samsung was more known for ripping off Japanese goods but now it is a world’s technology leader despite the patent court battles with Apple. Korean films are now recognised globally and you can even find kimchi, the fermented cabbage in supermarkets. It’s hot right now as an upcoming city. Japan has struggled to reinvent itself while parts of Seoul are buzzing with enterpreneurial spirit mostly found in the renewal of Itaweon. 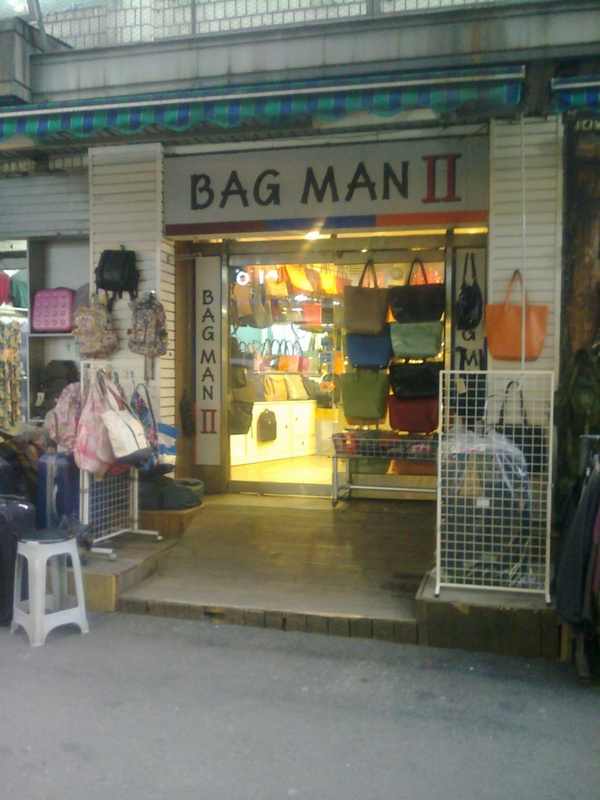 Once the foreigner hangout few Koreans visited, it is now a cool place to be. International bands rather than just DJs are arriving. The streets were full of too many cafes and restaurants. Not all will survive and too many looked empty. Koreans like the Japanese are more open to taking loans and credit than before. The bubble will burst sadly. 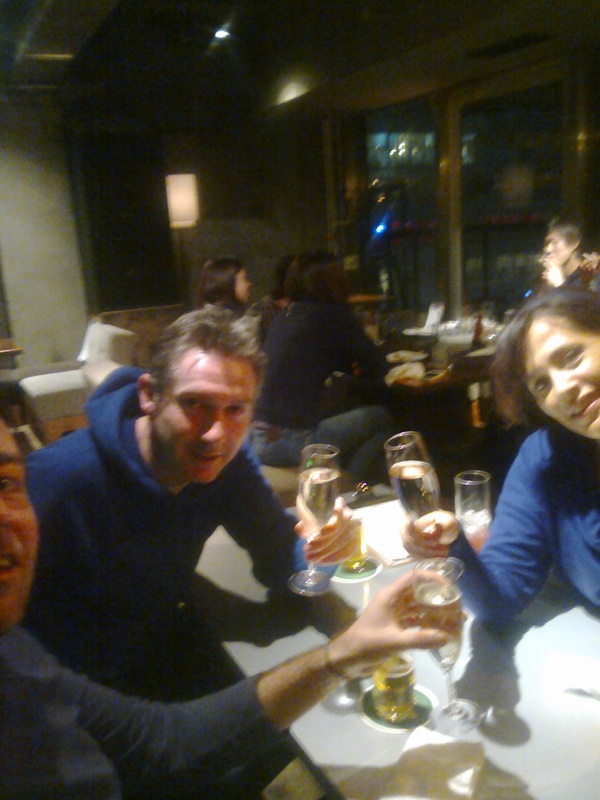 But I was in Seoul to meet Dan and Nev and see some old times. The sights have changed but the scene hadn’t. 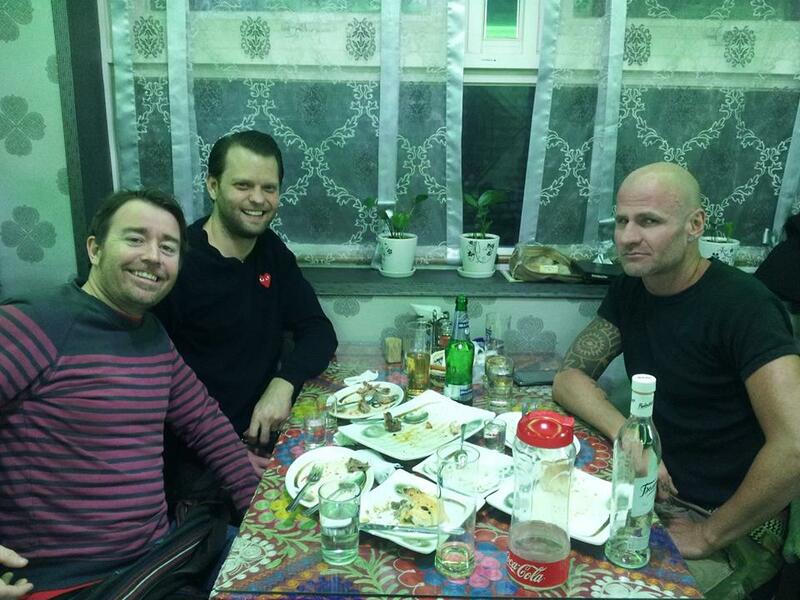 We ate at a Russian restaurant accompanied by the usual liquor and then hit up some bars. 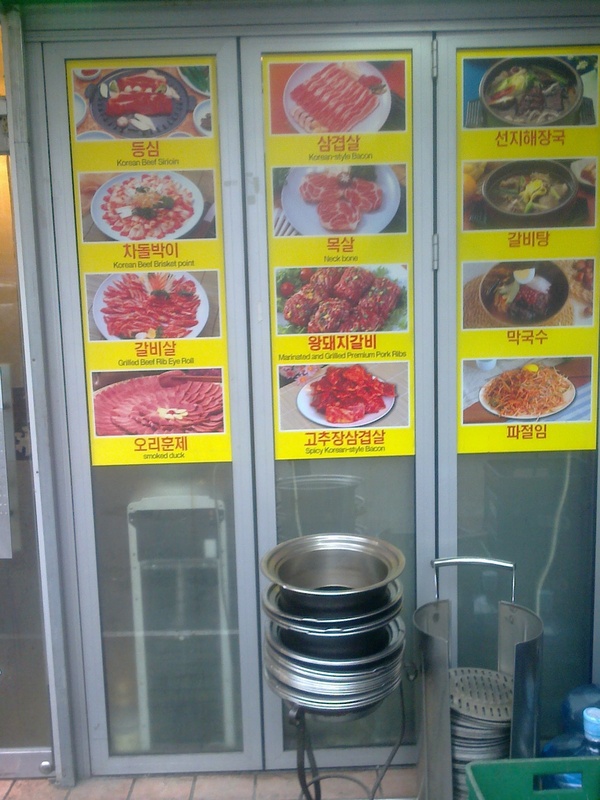 The next night involved the same but the food was kalbi and the night more celebratory. 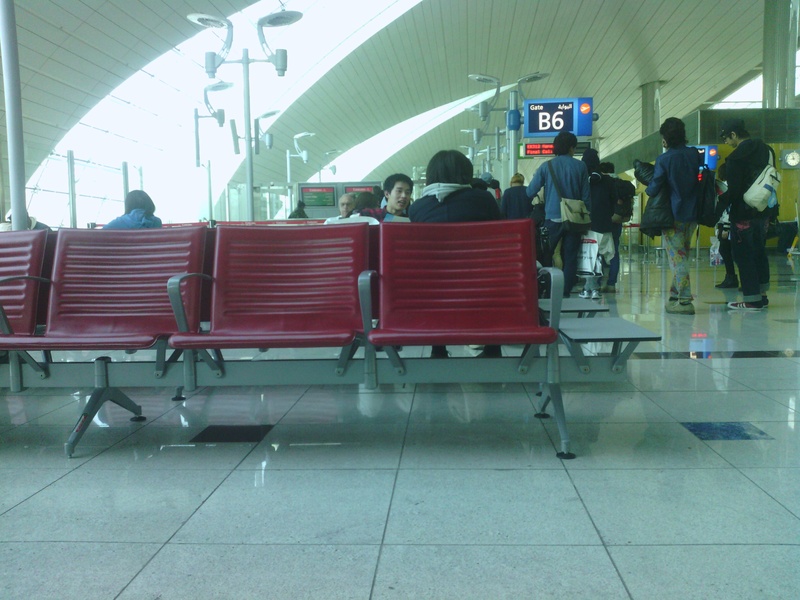 When I left Korea in 2005, I was happy to go. I felt stale and like I’d aged. I needed a new start or maybe just less kalbi and soju! But this time I felt happy to have seen it. There is much opportunity in Korea to make and save money. But is that enough? I’ve had such experiences before. I’ve never bored of sitting at the window looking out over the world. Landscapes gain a grandeur only tourist adverts allow you to peak at. In developed countries 70% of the world’s population live in cities these days. And they too have their attractions, even vast conurbations such as Tokyo. Flying into Rome was special a few months ago. We could clearly see the Coliseum and St Peter’s in the Vatican. Sao Paolo and Mexico City were the biggest cities I’d flown into and like Tokyo it lacks a centre, a heart and clear distinctions from the air. Yet they still impress as communal masses. I started to film Tokyo as we flew out. Then my arms got tired! Returning to Japan was an exciting and nervous moment for me. Some of you might know the story! But equally I was nervous and excited to know if my memories had served me correct. If what I remembered was real and not overwhelmed by selective memories and nostalgia. Walking through Tokyo, a city I barely knew, if you can, was exciting. But returning to Kyoto, a golden period in a pretty fortunate life confirmed all I needed. As the snow petals fell as I waited for Scott, I watched the walkers, illuminated by a million lights, braving the cold, I’d not been fooled. What I remembered mostly and could never grasp was the levels of culture. Everyday you could walk down the same street and see something different. You were constantly surprised. The detail and attention given by the Japanese to present wrapping is an example. It’s a trained perfection. Pride is revealed by the shock and embarrassment when such standards are not reached. On deeper levels there is a social meaning for every action and non-action. The silences are inhabited by such value. Few foreigners understand this. Few make the effort. Most simply continue on assuming everyone agrees with their statements and actions, that they are the charismatic leader of the scene. They rarely learn much. The depth is mind-boggling. However even the Japanese can find it difficult to explain why certain actions are necessary. A similar example can be found when reading Japanese newspapers. Japanese has three alphabets; hiragana for grammar and verbs, katakana for foreign words and kanji for nouns. There are so many Kanji (more than 10,000) you need to read through the context to understand. Most Japanese aren’t able to full read or understand their own language. Imagine the trouble for foreigners. All language is culturally-based but even if you are born into it, Japanese can be problematic. I remember Yukiko lived in the US for 4 years from the age of 7 to 11 years. Her English was excellent, if with a real American accent but her Japanese suffered and she found it difficult to keep up. Tokyo is an entanglement of trains, roads and elevated highways. Riding into the city in a taxi feels like an episode of Grand Theft Auto as we screamed and bumped through neon-lit tunnels. 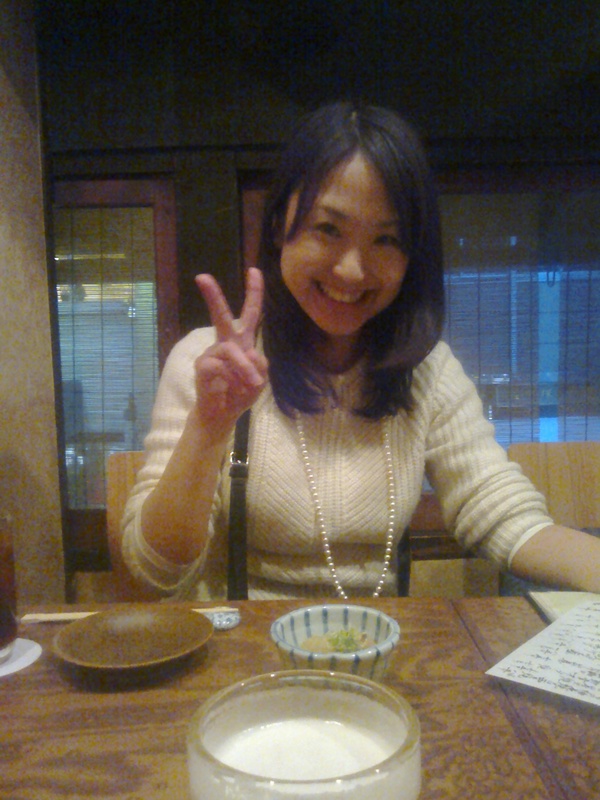 The first night in Tokyo involved going to Mayu’s favourite restaurant and drinking sochu with locals. We may not have understood each other but between us we got the point across. The next night we headed to Shibuya and had the most Japanese day imaginable. With Ponchan and Mayu and later Kenta we went to Uniglo to buy clothes, ate okonomiyaki, a Japanese pancake and at 4am Yoshinoya, Japanese fast food, drank ashasi, sang karaoke, played bowling, crossed the Shibuya junction, ate under at Under the Sea and took the first train back. I managed to shout out ‘hey isn’t that a love hotel?’ just as a couple walked out the door. The next day I took the bullet train with a bento and stayed 3 nights in Kyoto. Everything is clean with an army of washers and polishers in attendance. Manicured fields and perfect streets sat under distant mountains. A Japanese man cracked his egg on the bench, pouring the remanents into a bowl. I was tired and slept. Later I looked out the window and there was Kyoto. The station is magnificent. Kyoto Tower over looks it. I stayed with Liz and Meeting Scott, Liz and Yumi in Kyoto, wandering the streets and refinding myself was beautiful. I knew my way instantly. It was Kansai damashi! We found a bar with live blues, a tiny intimate venue. We picked up an American and after 3 hours of karaoke with Liz, It was 730am and we went for some food. Getting home that late was normal in Japan and now I was back in Japan. Workers in Japanese are all Japanese. Students man the lower-end jobs in karaoke, bars, restaurants and convenience stores. There is no out-sourcing of effort. Everyone learns from the bottom up and their responsibility. The shops and restaurants rings out with practiced greetings. It’s all ritualised, cute and also slightly disturbing. The next two nights I met Scott, my old drinking buddy from Kyoto, a guy who always made me laugh and later with Yumi for some amazing food. It was lovely to see her. 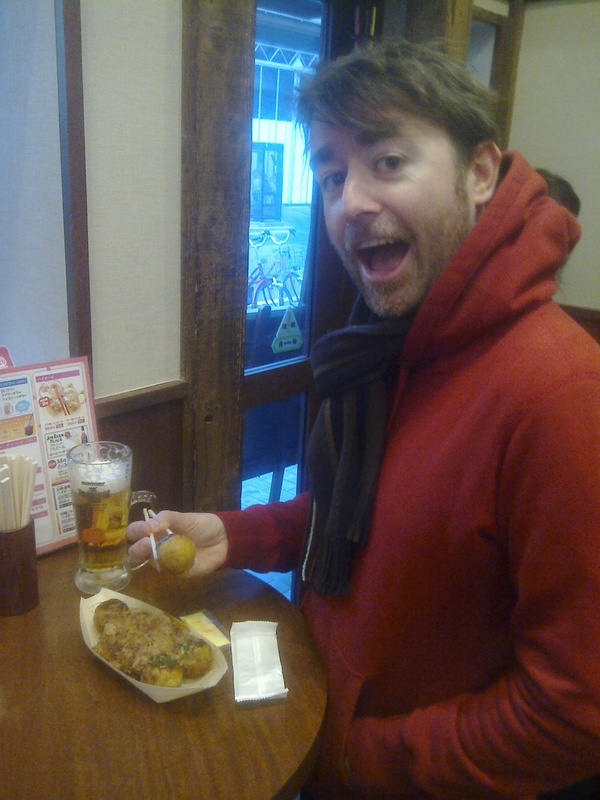 After a quick trip to Seoul (more later), I returned for one last night in Tokyo followed some tayoyaki, real Japanese food. I left happy, more than happy. It was worth the nerves. I’ll know I’ll be back again and again. So I know I’m going to Japan because waiting at the gate everything is different from just 20 metres away. You have the endless numbers of glasses for starters. The formal style on the men with the spikey, manga haircuts and plain colours. The women wear their ill-matching colours, layers over layers, scarfs and jackets and funny shoes. Everyone looks like their mum dressed them on speed. Then there is always the Japanese guy who travels, wears his Indian threads and has a beard. Japanese men follow their girlfriends around and no one says anything. 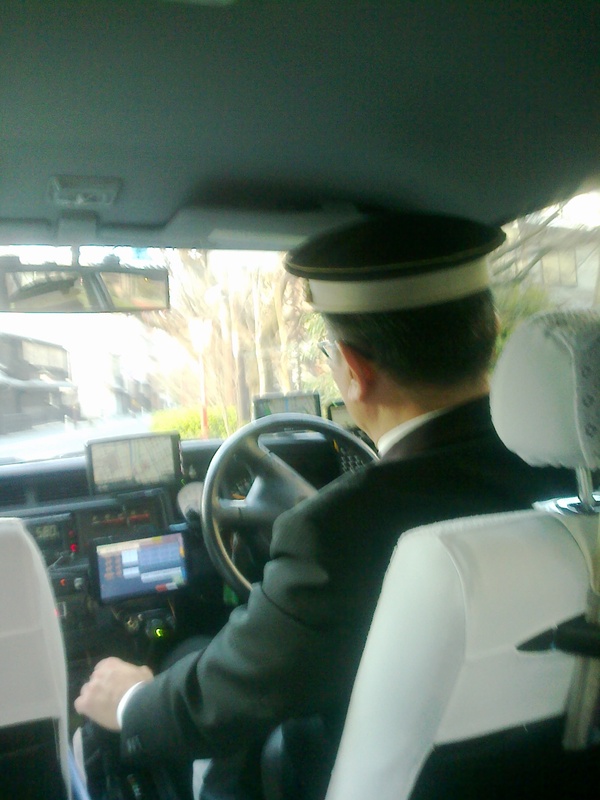 The occasional Japanese is wearing a white surgical mask, a forlorn attempt to keep the germs away. A group of Pakistani men in their dress walk past and looked. The Japanese don’t notice. The waiting is quiet. The gate is open but there is no rush. No one wants to go first. So you apologetically, or serrenditiously stand up, like you are just stretching. It’s a young crowd of boarders, all in their 20s, like some university trip. Most have boarded and I can’t remember anything. We can’t wait any longer. It’s the final call. Time to go back to Japan. February is always a short month , usually packed with atrocious weather and broken new year promises. However this February was especially quick. I’m not sure exactly why but being busy with work and outside projects brings a feeling of contentment or possibly just distraction. And all this is times of no drinking. Drinking here is a distraction. As you get older the hangovers get worse for most. For me it’s more the case that a hangover creates a vacuum in your head, an inability to formulate or think inventively to smooth the path through it all. Alongside being in Qatar this is truly problematic. But I’ve been distracted. The big event was the British Council Away Day last week. I was on the organising committee with three others and together we organised a day at a desert museum, some team building, get to know you activities, sports and an information treasure hunt. 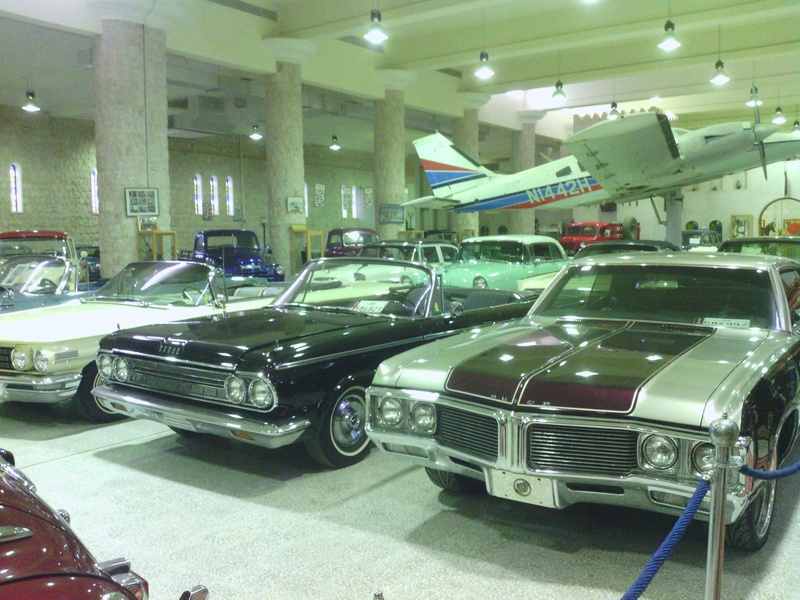 We held it at Sheikh Faisal’s Museum in the middle of the country, a country so small it was still only 30 minutes from the office. Sheikh Faisal is one of the richest men in the country and spends his money buying artifact, old and new, from around the world. These include old Korans and Bibles, cars older than 100 years, weapons and clothes. It’s a very random hodge-potch of things housed in his every expanding museum. It’s presently building an extension to house some more of his 600 cars! The next night we finally headed out to the desert for a desert safari. 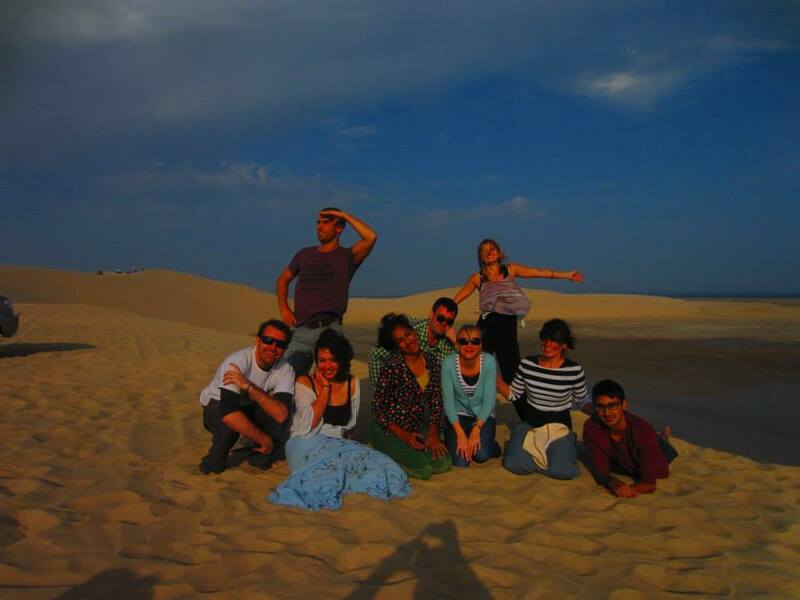 A group of 9 dune-bashed, bbq’d swam in the ocean and played silly games before sleeping in large tents. The dunes are unique here. 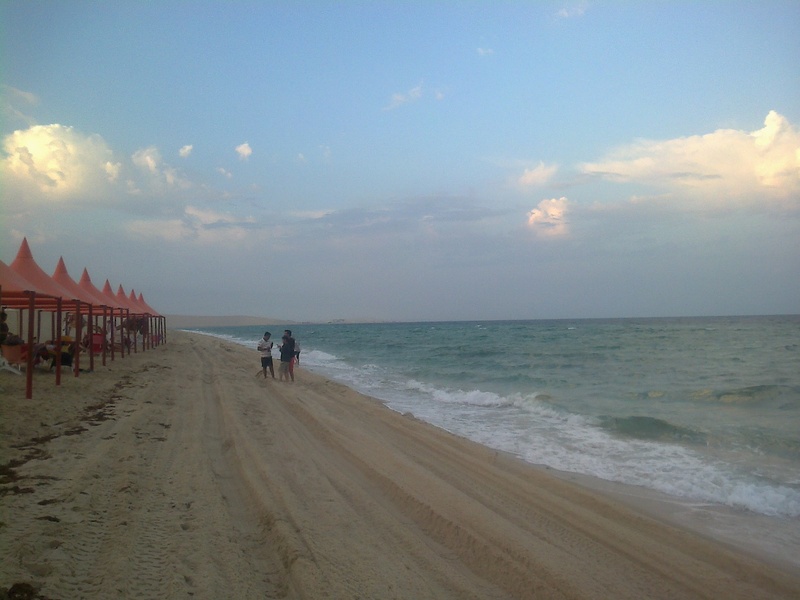 They sit next to the Persian Gulf right on the sea front. As the sun set over them, it was all very pretty. The final contract with the Ministry of Foreign Affairs has begun again. I’m happy with it. The group is much more motivated and capable than the last lot. I can actually aspire to recommending most of them to go work abroad. I hope I’m not speaking too soon but they are a nice, hard-working bunch. I’m also working with a luxury company and a private school training staff. Outside of work, we’ve been busy watching rugby, running and exercising and eat some more sushi. The England v Ireland game was immense for it’s levels of commitment, positive play and tension. Two good team without any poor performances. The lady I am helping with her academic research is making some real progress and will hopefully be accepted for a scholarship. The reading has merged into my thinking. Ideas over collective memory are becoming increasingly interesting and the state’s use of public memory in the building and maintenance of nationalism. I’ve incorporated it into my personal statement for university. Japanese lessons continue unabated and now have a practical purpose. For the first time in over 11 years, I’m going back to Japan and Korea after over 8 years. I’ll be seeing Liz, Scotto, Mayu, Yumi, Dan, Nev and a few others.